The ability to clear the ARP cache/table for an ESXi host is feature that has been requested from customers from time to time and usually for diagnosing network related issues. In previous releases, this was not something you could easily do and it was nice to see this feature get implemented in a new ESXCLI command that will be available as part of the vSphere 5.5 release. You can list ARP table entries using the "list" operation and you can now clear a specific ARP entry using the "remove" operation. To clear an ARP entry, you will need to specify the IP Address you wish to clear, the IP protocol whether it is IPv4 or IPv6 and you also have the option to specify the particular VMkernel interface. If you do not specify the particular VMKernel interface, then the entry will be removed for all interfaces. This will definitely be a useful ESXCLI command to be aware of the next time you need to troubleshoot a network issue! Note: I mentioned earlier that clearing the ARP cache was not something that you could do prior to vSphere 5.5. However, while working on this article, I actually learned it was possible to clear the ARP cache, but it was not very user friendly like the new ESXCLI 5.5 command. 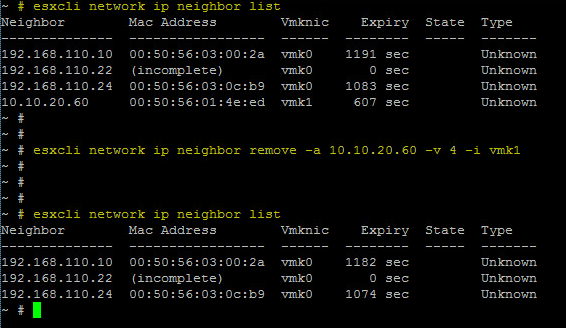 In a separate article, I will show you how can clear the ARP cache on earlier versions of ESXi. If you wish to clear the ARP cache on an ESXi host prior to ESXi 5.5, please take a look at this article for more details.